Future Meat Technologies is an Israeli startup opened up in 2017 by Dr. Yaakov Nahmias, the co-founder of another animal-free meat startup known as SuperMeat. Following the initial success of SuperMeat, Dr. Nahmias decided to branch out and begin his own independent startup that aimed to expand the accessibility to cell-based meat products in order to meet more local and even individual needs. It recently received over $2 million, funded in part by a collaborative grant between Israel and China﻿ and in collaboration with Israel's Modern Agriculture Foundation, and several other companies including chicken production giant Tyson﻿ Foods. ﻿Animal-derived meat products are a central part of diets around the world. People in more developed countries like the United States eat about 210 pounds of meat per year, while people in developing countries eat about 66 pounds annually, but that figure is rising. This growth in meat consupmtion is due, in part, to the decreasing cost of meat, however, this comes with consequences, including poorer animal welfare, antibiotic resistance and deforestation, and other negative environmental impacts. ﻿Research suggests that using cultured meat rather than conventional meat would result in a reduced environmental impact, making it much more sustainable for the growing population. Other studies take into account the fiscal cost of animal mean comsumptions, comparing meat-based vs plant-based diets. These studies estimate that if current trends of meat consumption continue, it could cost the United States between $197 billion and $289 billion per year by 2050. While it is difficult to say when cultured meat will be competitively priced with animal-derived meat, and although the cost is still substantial, it has come down significantly in the past few years, and is expected to continue this trend as the technology improves. As previously mentioned, the current cost of the process to generate animal free meat products is generally understood to be too expensive for general consumption. The Dutch government has invested $2.4 million alone in a project that would cultivate pork from stem cells. However, Dr. Nahmias is optimistic about cost accessibility as the technology develops. 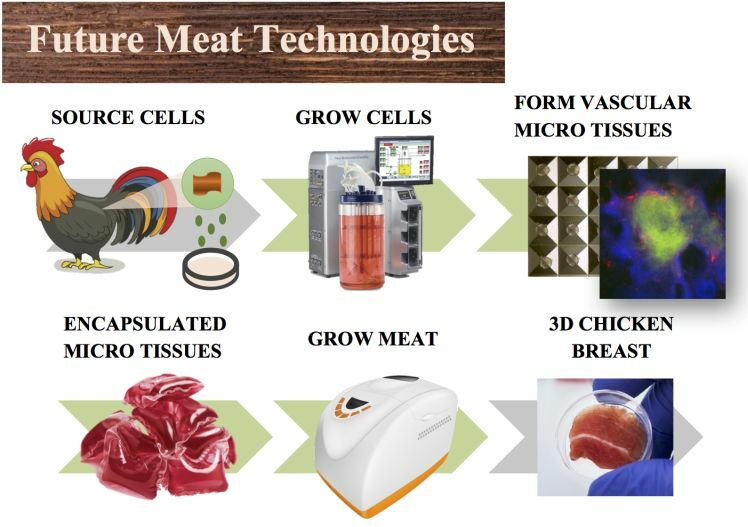 The Future Meat Technologies capsule design mimics animal physiology using a dialysis circuit to recirculate the culture medium, eliminating ammonia and reducing consumable costs. Nahmias predicts that each production unit will ultimately cost around $300, and will be capable of producing clean meat for around $5 per kilogram. SuperMeat is an Israeli biotechnology company, founded on December 15, 2015. SuperMeat is working to develop chicken meat products cultured from extracted chicken cells. I am a scientist with a PhD in cell, molecular, and developmental biology. I specialize in stem cells and am interested in cancer biology.